Aaron Kendell Packaging Equipment (AEK) has a large inventory of reconditioned, unused, and used carbonated monoblock beverage equipment. If you are looking to sell your used carbonated monoblock beverage equipment submit a request online or contact KC Christensen at 630-238-2660. Used- Peter Markl Pirzer 16/4 Counter Pressure Micro Brewery Beer Filling Line. Used- Peter Markl Pirzer 16/4 Counter Pressure Micro Brewery Beer Bottle Filling Line. Consists of 3.5' x 6' infeed accumulation feed table, with SEW-EURODRIVE motors, VFD Speed controls and disconnects, Rexnord HP8505 Belting, 304 Stainless Steel construction. An Inline Labeling Systems Model # 1000FS S/N P556 Wraparound Pressure Sensitive Labeler. Has worm screw infeed, PLC interface controlling all machine function, Photo Eye Detection and Gap detection for labeling, Hot stamp ribbon coder for date or lot numbering, Letters and Numbers for configuring coder included, Documentation and established settings. BEVCO Conveying Systems Grip Rinser S/N J1640, Adjustable for various bottle sizes, Pillow Block single hand lever adjustment, Rubber Grippers and Plastic flight Chain Drive. Peter Markl PIRZER 16/4 Counter Pressure Filler, Quad Head Mechanical crowner, Long Tube Filler Model# 8402 S/N 50264, CO2 Flushing / Pressurization Pre-Filling. Supporting conveyors for full line configuration. Labeler to Rinser, Rinser to Filler, VFD Speed controls and disconnect. Post Fill Rinse Cage, Clear vinyl Inspection Cover, Bottom and Top Spray Nozzles. Post Mass Accumulation Table, Each SEW-EURODRIVE Motor, VFD Speed controls and disconnect, VFD Speed controls and disconnect, Rexnord HP8505 Belting, 304 Stainless Steel construction. Aqua Pur Ultra Violet rinsing system (UV light system for the sterile water), GPM Flow Rate, 365 Day electronic timer. 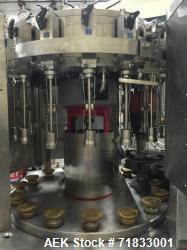 CIP Cleaning, 16 Assemblies for each filler tube, CIP bar for filler. 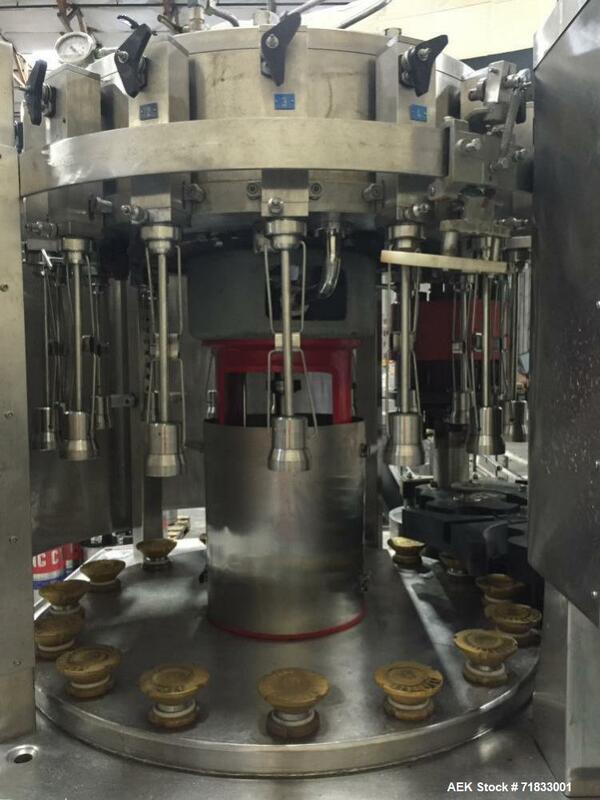 Filling Machine Spare Parts Rinser Spare Parts, Lifting Cylinder Assembly, Valves, Gaskets, O-ring and Seals, Serviceable Spare Filling Tubes, Plastic Flights Rubber Grippers, Star wheels and boundary guards for different bottle sizes.